Crown Princess Victoria, Prince Daniel and Princess Estelle attended the Stockholm KISS Concert at the Tele2 Arena in Stockholm, Sweden, at the last weekend (06 May 2017). Also, Princess Estelle went backstage to meet the band. 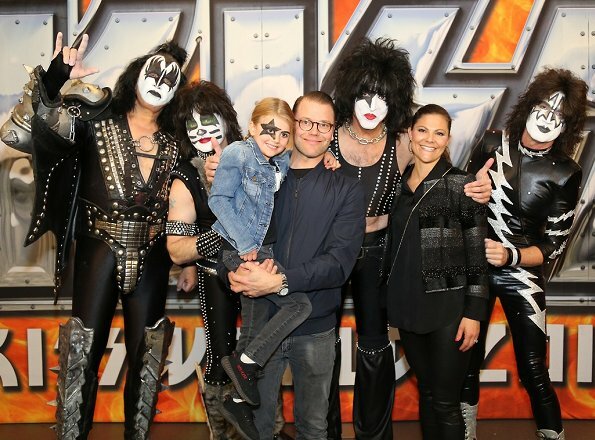 Tommy Thayer, Gene Simmons, Rockers Paul Stanley and Eric Singer have posed with Princess Estelle and her parents, Crown Princess Victoria and Prince Daniel. Awesome! I follow Gene Simmons and family on IG and knew they were in Sweden. They have been on tour all over Russia and Scandanavia. Too cute that Estelle got her 'star' eye. Isn't Estelle kind of young for a KISS concert? 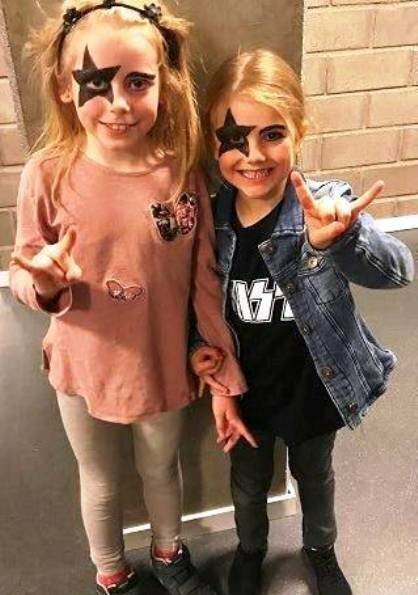 KISS has many young fans these days! If Victoria and Daniel play KISS music then I bet she likes them too. Why not? They are a lot tamer than in the 70's. It nice she had fun but I was wondering that. My thoughts too... and even younger to be making a "Devils rock sign with her hand". I'm sure she had ear muffin and all that, they're smart in that way her parents, but still... oh well. It might have been a bit loud for her. Hopefully they gave her ear protections. My husband and I went to see Kiss last August and they were fantastic. There was nothing crude or scary about the concert. Just some old guys in spandex enjoying making music. My only regret was that our 13 and 11 year old boys didn't come with us. But we took them with us to the Def Leppard concert a month later! I think it's interesting how the Crown Princely couple dress to a heavy metal rock concert. Too bad CP Victoria wouldnt wear her hair down. Even for this. Mrs M that sign is used for many things. It is actually the sign we flash for the University of Texas ie the LONGHORNS. There is nothing satanic about it. People make things bad and or negative. It is also used at two Christian private schools that I know of...one is Catholic. They are also the Longhorns. KISS is far from Satanic. These guys are in their 60s and actually very traditional. Diane, hook 'em horns!!!!! My mother went to UT! Woo hoo Chelsea! My middle son went to UT! I went to OU the BETTER school and arch rival LOL Boomer Sooner. Diane, you better not say that about OU around my mother. She is a die hard longhorn! You say anything bad about her alma matter and oh boy, prepare for a fight hahaha. LOL yes the Battle of the Red River is fierce! I lived in Texas 25 yrs. Try having a OU alumni on your auto and live there. Plus a son who went there. The other two are Aggies Tx A&M. Their Dad a Baylor grad. Utter chaos but fun! Now that's some serious rivalry going on lol. My mother was born and raised in Texas, she moved to New York after graduating college. My dad is a native new yorker and he till this day does not get the UT/OU rivalry. I have some great memories of my family flying back to Texas and cheering on UT. I haven't been in a few years. My mom still goes almost every year, she meets up with her sorority sisters and has the best time. I remember she was a little dissapointed when I told her I wasn't going to follow in her footsteps and go to UT lol. Oh my! Hysterical and what fun! That is hilarious! Who is the other little girl, I wonder? What fun, good for them. Victoria please, let your hair down in a rock concert! Estelle is so young. Kids of her age should listen cartoon music, this is too much. I'm surprised that Victoria and Daniel are fans of this satanic band. Big dissapointment. Well, Lassie I was very surprised too when I saw Estelle so involved in this concert - I don't mind if her parents are there - but she? No way!!! Thank you for your comment Masha! Estelle and her friend weren't the only kids there. On their Twitter page they posted a collage of all the "KISSkids" that were there and it was quite a few. I see nothing wrong with her going. KISS is not the "devils music". Obviously Victoria and Daniel didn't have a problem with her being there, she looked like she was having a fun time. So it's no one's place to judge how they choose to parent their child. Seriously some of you guys on here need to loosen up. They are not the band of the 70s and 80s. Of course the painted faces and antics then seemed adverse to society. Those days are gone. But part of their schtick is the costume. They spend much of their time playing for vets and are very much into playing for charity. Gene Simmons has an IQ of around 200 and is quite the intellectual. Raised two wonderfully stable children. A long term relationship and marriage. He is really conservative in his views. Old fashioned to my surprise. No drinking. No drugs. No smoking EVER. Clean living. I doubt that Victoria and Daniel would subject their daughter to satanic anything. Not a concert for a five year old. Lol @Doni! You can tell us all "I told you so" if it turns out to be. She is a lovely mother, lovely representative of her country, and never fails to keep us guessing in the fashion department. National Day won't tell us anything but birthday celebrations in July will! I think that the concert was ok for her. Kids her age experience it on a different level and see the rocker outfits like costumes (much like Halloween stuff), the see the make-up as fun (much like kids´ facepaint), the enjoy the lights and sounds of the show (much like fireworks or other special effects). They don´t analyse the meaning of the songs (if they even understand them). And I don´t think that the noise level would be a problem (relative to the stuff kids experience daily (like the noise level of any kindergarten...), and if it´s too much, you can always use protection. This concert wouldn´t have been my guess of what to take the kids to, but why actually not? Estelle is a STAR! I am so glad for her, that she can be a(relatively) normal kid. Five years old is the perfect age to start getting musical culture. Whether you like it or not, KISS is culture. Bravo!